You'll be £12.99 closer to your next £10.00 credit when you purchase Beggars, Cheats and Forgers. What's this? 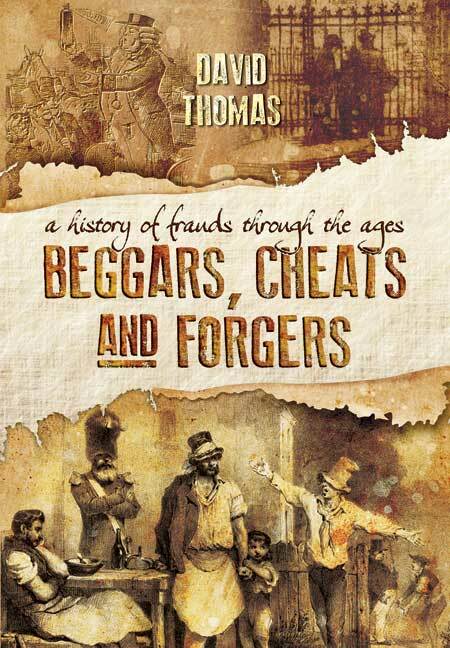 Beggars, Cheats and Forgers is made up of new research into a neglected area of British history: the stories of historical scams, cheats and forgeries. Former Director of Technology at the National Archives, David Thomas has delved into the archives to uncover unusual tales, from Tudor identity theft to the Spanish Prisoner letter scam of the eighteenth and nineteenth centuries. This book provides an fresh take on criminal history and the roots of identity theft, email scams and pyramid schemes still employed by criminals today. As featured in Hertfordshire Life Magazine, Wiltshire Times, Bradway Bugle and My Croxley News. This book is thought provoking and will reward the reader's time. ...this is a readable account of many intriguing schemes to fleece the unwary, credulous and, in many cases, downright greedy. Delving into the archives, Thomas has uncovered new stories of historical scams, cheats and forgeries from Tudor identity theft to the Spanish Prisoner of War scam of the 18th and 19th centuries. A compilation of new research into forgotten areas of British history, from a former director of technology at the National Archives. It includes stories of historical scams, cheats and forgeries, providing a fresh insight on criminal history and schemes. David Thomas is the former Director of Technology at the National Archives, where he was responsible for systems, the online catalogue, the website and the preservation of digital records. He has a long-standing interest in crime, imprisonment and poverty and has written extensively on these topics for family history magazines. He is the author of Beggars Cheats and Forgers: A History of Frauds Through the Ages (Pen & Sword, 2014).